After much thought, I recently reached a conclusion on where my primary collecting focus will be over the coming months. Quite simply, I intend to concentrate on on-card auto cards of the great players from the 1990s. This was the decade that I first got into basketball cards and really started paying attention to the game itself. So it seemed sensible to head back to where it all began. In order to limit the players that I will concentrate on, the criteria that I have set myself is that the player must have been both an NBA All-Star and won an NBA Championship, as well either be in the NBA Hall of Fame, or pretty much guaranteed to end up there in the next few years. In essence, this means that I am looking at adding autograph cards from the likes of Larry Bird, Magic Johnson, Clyde Drexler, Hakeem Olajuwon, Dennis Rodman, David Robinson, Scottie Pippen and John Stockton. I will also include current stars such as Jason Kidd, Kevin Garnett and Paul Pierce who were all drafted in the 1990s, have championship rings and will no doubt end up in the Hall of Fame. In theory it means I will be bidding left right and centre on Kobe & Jordan cards...but I think my budget will temper that approach! 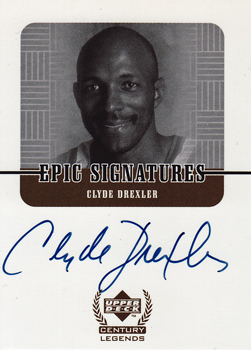 First to land is a 1999 Upper Deck Legends Epic Signatures card of Clyde 'The Glide' Drexler. I vividly remember staying up to all hours watching Drexler win his first and only NBA Championship in 1995 alongside Hakeem Olajuwon, after being traded by the Blazers to the Rockets in February of that same year. The Epic Signatures card is a very simple design - just a head shot on white background - that works wonders in my book and a great way to get things up and running.